Breathing in and breathing out—it’s something we do unconsciously, and they say it’s the easiest thing in the world. Yet many people—especially when doing sport—underestimate their breathing, which can be problematic in a number of ways. If you don’t get your breathing right, you get out of breath more quickly and you aren’t able to summon as much power. We explore the reasons why that is the case and take a look at what points you should pay attention to when it comes to your breathing. Abdominal breathing is better than chest breathing. Even though most people tend to breathe more with their chest as this avoids making the stomach bulge out unattractively, breathing through our stomach is simply better for our body. This is because breathing with our stomach also involves the diaphragm, and since this can be responsible for up to 80 percent of our respiratory volume, abdominal breathing can therefore increase respiratory volume. This enhances the oxygen supply, making it ideal when we are doing a lot of physical activity. When it’s cold, breathe through your nose. This warms the cold air up before it reaches your bronchial tubes. Breathing in air that is too cold can cause the bronchial tubes to become constricted, decreasing your performance. You should always breathe in and out deeply, especially when exercising. This enables your body to get rid of as much air containing carbon dioxide as possible. It also allows you to breathe in particularly large amounts of important, fresh oxygen again. Depending on the kind of sport, however, it is also important to pay attention to your own breathing on an individual basis. 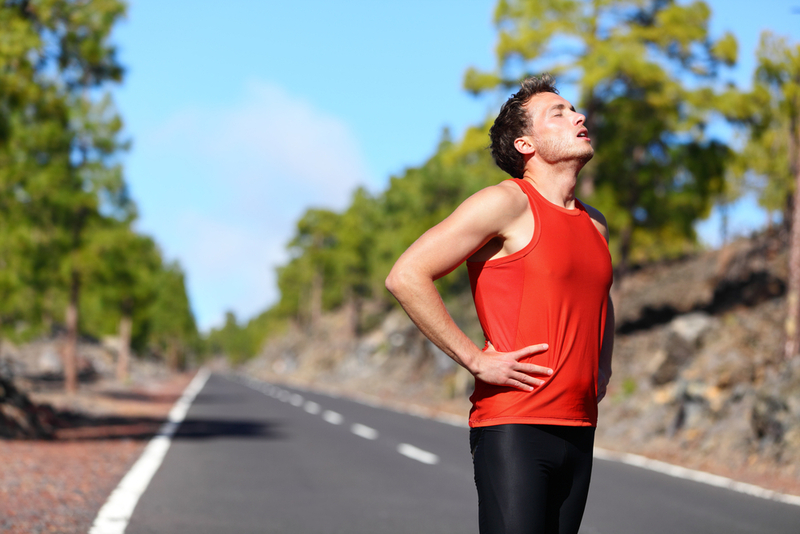 Unfortunately, many runners make the mistake of adapting their breathing to match their running pace or the beat of the music they are listening to. Yet experts advise against this. Instead, it’s important to breathe out deeply from your stomach—to get rid of as much carbon dioxide as possible and then to be able to take in oxygen again properly. Not only does this ensure your body is supplied with sufficient oxygen, but it can also prevent you getting side stitch, because it makes it less likely you will get cramp in your diaphragm. Some people recommend breathing in after a certain number of strides and then out again after a certain number of strides. This can also be problematic, however, as focusing so much on counting your steps and on your breathing is actually more likely to disrupt your breathing and cause stitch, for example. So there’s no need to monitor your breathing so closely. Instead, focus on breathing out deeply and then breathing in again just as deeply, to provide enough oxygen for your next personal best. Aerodynamics is probably to blame for the fact that many cyclists ride with their upper body leaning forward at a very shallow angle. Unfortunately, this restricts the stomach and compresses the chest. As a result, although you are still actively breathing in, you are no longer able to breathe out optimally. Many cyclists who ride with their upper body tilted forward in this way therefore resort to shallow chest breathing. However, since deep abdominal breathing is much better, an upright posture would also make better sense. It may be helpful for cyclists to breathe through their mouths, however. This will help ensure that you take in as much oxygen as possible while you are cycling. Time and again, it is striking how many strength athletes hold their breath when they are exerting themselves, especially when lifting dumbbells. Yet this can lead to headaches, as intense pressure builds up in the lungs and head. By contrast, other athletes opt for short, shallow breathing. Neither is really a good idea, however. Instead, strength athletes should adopt the following approach to breathing: As your muscles take the strain, breathe out steadily. As you relieve the strain on your muscles, breathe in again. When you are swimming, your breathing technique will always depend on the swimming technique you are using. When you are doing breaststroke or backstroke, you just have to make sure you breathe in and out smoothly and steadily. If you’re doing the crawl, however, then you have to plan your breathing precisely—after all, your head is under water so you can’t just breathe in and out. That’s why most swimmers follow a three-stroke rhythm. They do three arm strokes and then take a breath. To do this, they turn their head to the side ever so slightly, so that their temples are above the water. This ensures you get the oxygen you need, even when you’re doing the crawl. The more you are able to control your breathing, the more oxygen you can take in—and the more power you will be able to summon. Try out the breathing techniques in this article and improve your performance with the right breathing!